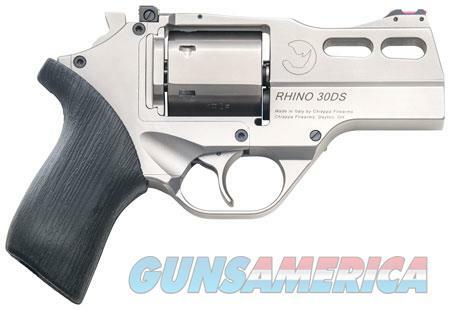 Description: The Rhino is the most innovative development in revolver technology in decades. It fires from the bottom of the cylinder rather than the top which dramatically reduces muzzle rise and recoil felt by lowering the axis of the bore almost to the palm of the shooters hand. An aluminum alloy frame and barrel shroud makes the Rhino lightweight and easy to carry. The snag resistant "hammer" is actually a cocking device because of the Rhino's innovative completely enclosed firing mechanism which can be fired either single or double action. A cocked indicator is clearly visible to indicate the internal hammer status. Another innovation is the hexagonal cylinder which keeps the revolver's width to a minimum. Included is a fiber optic front sight.